* I often substitute 1/3 avocado, diced for feta cheese, depending what I have on hand. I prefer to use the grill and make a whole batch of fillets, however, for those quick lunches the skillet works just as well. After spraying the pan with cooking spray, I season my fish with dried, minced onions and lemon pepper. 10 minutes on medium heat, flipping half way through. Cook until flaky. Play with it! Cucumbers and baby carrots are my staples. I've also love using peppers and avocados. The veggies carry the salad, so don't be stingy! I use about 2 cups of diced vegetables as my base. 3. Put it all your vegetables in a bowl and toss with olive oil and vinegar. Top with tilapia. 4. 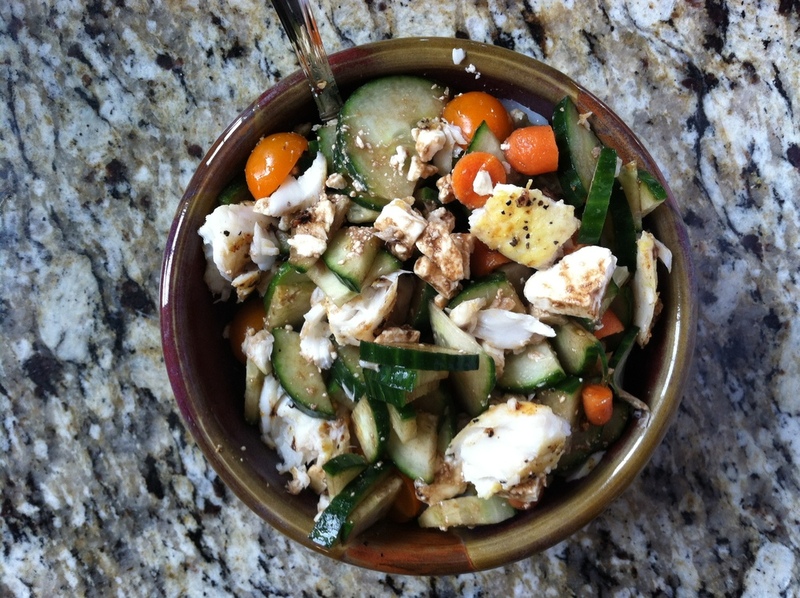 Flake your fish and mix with vegetable medley. Enjoy! I find that I enjoy this salad with warm fish just as much as I do with cold fish, which is why I make my fillets ahead of time and keep them in the fridge for leftover lunches! I have also substituted tilapia for chicken, turkey and tuna. All of which are just as tasty!